Patriot Prayer buses in activists from around the country, gets them into a fighting mood, and then tries to confront their opposition. It ends badly. 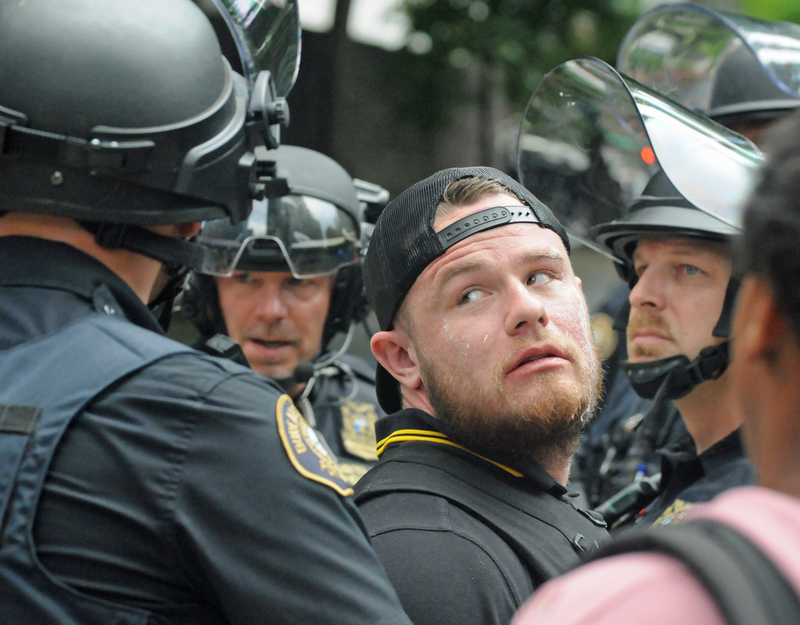 The far-right group Patriot Prayer threatened to “cleanse the streets of Portland” on Saturday with yet another rally, hinting at a repeat of the violence that’s been a regular feature of their “free speech” events over the past year. And true to form, the event eventually devolved into a huge melee with "antifascists" downtown. But when it was all over and the tear-gas clouds had cleared, the only cleansing to be seen involved washing pepper spray out of people’s faces and tending to injuries on both sides. 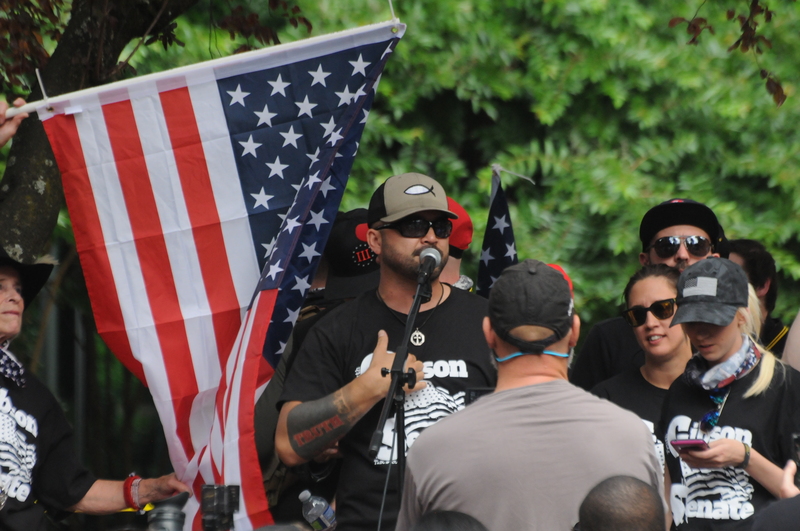 Joey Gibson addresses the crowd Saturday. Photo by David Neiwert. The far-right group has held a steady stream of “free speech” events in the West, and this latest rally started off uneventful. Right-wing “Patriots” and far-right Proud Boys, as well as some clusters of white nationalists, arrived at Terry Schrunk Federal Plaza and listened to a roster of speakers arranged by Joey Gibson, the organization’s founder and leader. Many of the arrivals came from around the country, and showed up on a school-bus shuttle to the venue. Then they tried marching out of the park and along several city blocks. That’s when things turned bad in a hurry, despite the best efforts of police to keep the violence to minimum. Within minutes, projectiles were flying, firecrackers and smoke bombs filled the streets with smoke, and the assaults – both by the Patriots and the antifascists who had come out to protest their presence – began. The fighting continued as the procession attempted to move through downtown, and became especially violent when marchers and protesters began brawling on side streets. The Patriot Prayer contingent was heavily outnumbered by counterprotesters. Photo by David Neiwert. Portland police declared the event a riot and shut the march down about six blocks into the city. The march gradually turned around and made its way back to the park, where barricades separated rallygoers from the counter-protesters. Many of the marchers arrived the worse for the wear, some requiring medical assistance. Before the evening was over, nine people were arrested. A number of others were hospitalized, some after being hit by projectiles fired by police. One of those people suffered a serious, but non-life-threatening injury, according to the police. Gibson originally conceived the event as a kind of response to the events of another Patriot Prayer rally on June 3, when only a relative handful of supporters showed up. 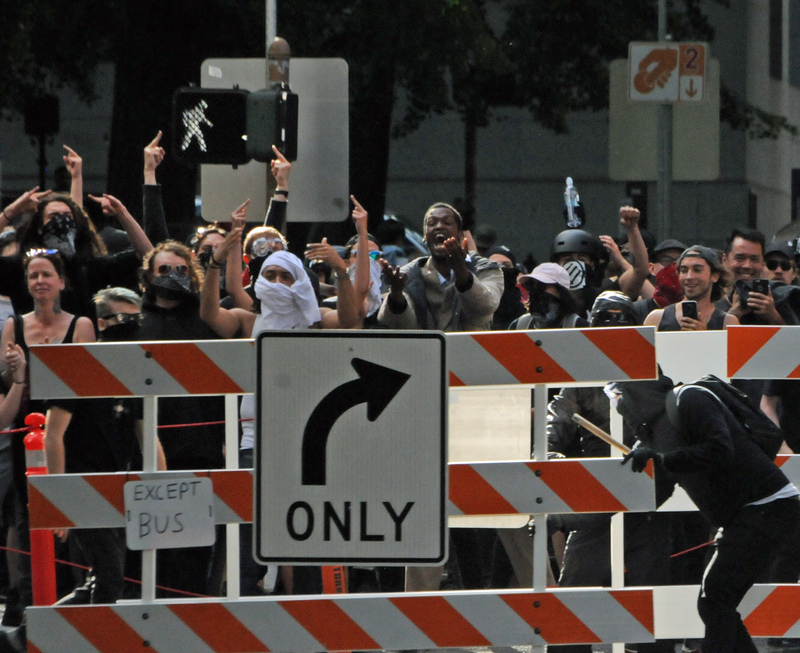 The group wound up being involved in a running series of violent brawls in downtown Portland, with the Patriots badly outnumbered by counter-protesters and often on the losing end of physical confrontations. Saturday’s rally was intended to bring in large numbers of supporters, particularly the Proud Boys. The polo-clad “Western chauvinists” have become a fixture at Gibson’s events, which have been occurring regularly in the Pacific Northwest, as well as elsewhere around the West, for well over a year now. A post from Patriot Prayer of Oregon. This Saturday … the stench-covered and liberal-occupied streets of Portland will be CLEANSED. The streets will be flowing with freedom, and the air will be filled with patriotism. The clouds shall part, the darkness shall fade, and the glory of America will shine forth! … Recourse will be swift, for those who wish to oppress our freedoms … And the hands of Justice shall smite them with a vengeance heretofore unknown to these ne’er-do-wells. The day before the rally, Gibson posted a video with instructions for would-be rallygoers to find the plaza. Alternatively, participants could catch one of the yellow school buses Patriot Prayer deployed to bring attendees to the rally. He said the plan was to gather at Schrunk Plaza, noting no weapons would be permitted. ﻿But he reassured participants that “security” would be stationed outside the rally point with guns. 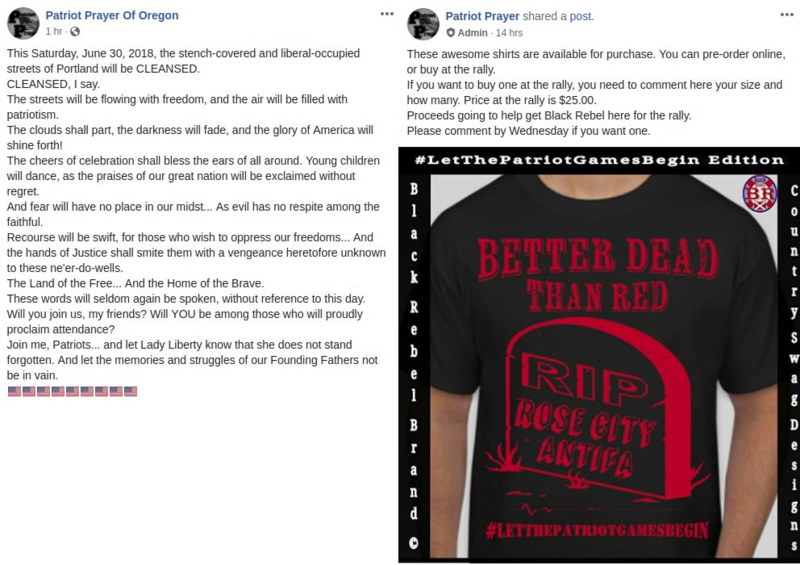 Patriot Prayer of Oregon also marketed T-shirts for rallygoers embossed with a design reading “Better Dead Than Red.” Those shirts were nowhere to be seen at the rally Saturday. However, the violent, conflict-focused rhetoric was very much in evidence. At one point, Gibson – who continues to campaign for the Republican nomination for a U.S. Senate seat in Washington – led the audience in a thundering singalong chant of “We will, we will rock you,” which soon led to a series of cheers of support for imprisoned British Identitarian Tommy Robinson. Gibson told the audience the group planned to make their responses into a “viral video” they would send to Robinson. Gibson's speech at some points became militant. He went on at length about George Washington and how he led his men to war. Another speaker, California “alt-lite” figure Haley Adams, disparaged Portland and its mayor. “We don’t have to leave the country to see a shithole, because you’re standing in a shithole today!” Adams told the audience. Police officers frequently consulted with key leaders inside the plaza. Photo by David Neiwert. 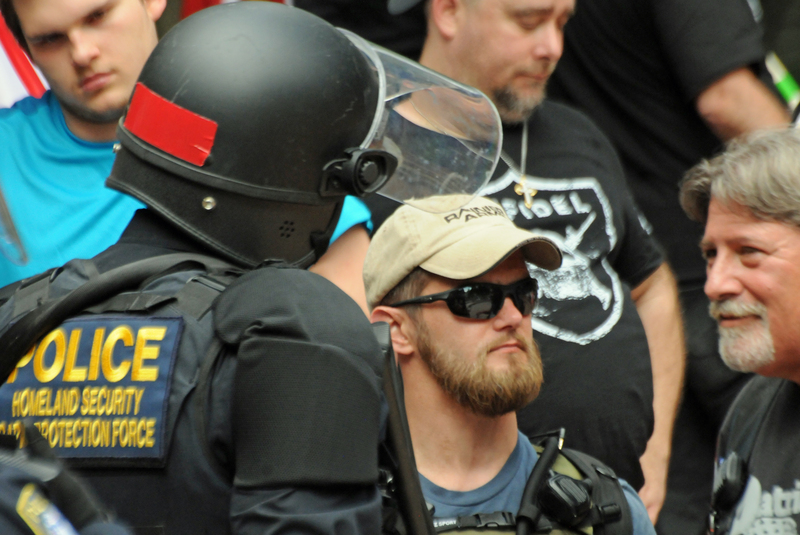 At times, it appeared the law enforcement officers – which besides Portland police included officers from the Department of Homeland Security and the Multnomah Sheriff’s Office – were there primarily to provide protection for the Patriot Prayer followers. Officers seemed to be frequently consulting with leaders of the Proud Boys contingent and other key members of the crowd. The rally remained peaceful while inside the plaza, even as the gathering of about 200 Patriots – some of them wearing militia gear and III Percent hats, others in bright alt-right costumes, and most of all large numbers of Fred Perry-clad Proud Boys – gradually was heavily outnumbered by the 500 or so counter-protesters who filled up the park in the adjacent block and shouted at them. The police plan to keep the two sides separated was largely successful when the rally was contained. But when it became a march, which rounded a corner directly in front of the protesters, the conflict was almost inevitable. Some of the ugliest fighting took place in the side streets, particularly on Main Street between Second and Third Avenues. As the Patriots marched down Second, a number of Proud Boys diverted up Main, where they shortly encountered antifascists coming the other direction, many of them fleeing tear gas being used by police. This led to pitched battles between clusters of red MAGA-hatted right-wingers and black-clad antifascists. Police arrest Proud Boys member Ethan Nordean. Photo by David Neiwert. One eyewitness told Hatewatch he saw a group of six Proud Boys kicking a man lying on the street, while one of them held him in a chokehold. He said he had only been there to observe and take photographs, but he intervened because he feared the Proud Boys would kill the protester. He said he was hit in the face before managing to run away. After the marchers returned to the plaza, their leaders held a closing rally of sorts where they licked their wounds and cheered their action that day. As they did so, police chased most of the remaining counter-protesters out of the adjacent park with pepper spray and threats of arrest. Finally, with phalanxes of police protecting them, the rallygoers began boarding their buses back to Vancouver. A group of about thirty remained behind, clustered on a street corner exchanging taunts with a lingering contingent of counter-protesters. Even that small gathering threatened to devolve into a brawl, until police threw a couple of flashbang devices into the cluster and broke up the situation. Eventually, all the would-be warriors who vowed to clean up the streets of Portland boarded the last bus home, where they could clean out the pepper spray residue from their eyes.